Novotrans Group of companies, one of the largest Russian operators of rolling stock and providers of freight railway logistics, intends to build an international terminal at the Ust-Luga port to handle export grain flows, export and import of foodstuffs as well as general and bulk cargoes. The project of LUGAPORT multipurpose terminal will be presented at the Russian Investment Forum in Sochi that will take place on 15-16 February 2018, informs the press service of Novotrans. The project is developed within Phases 4, 5 and 6 of the general cargo complex in the Sea Trade Port of Ust-Luga. 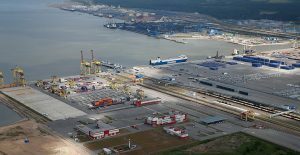 LUGAPORT will create a competitive port infrastructure on the Russian Baltic coast with the aim to re-direct cargo traffic from the Baltic states ports to the Russian facilities, increase export volumes of the national enterprises and generate thousands of jobs in the region. Although the Group does not disclose more information prior to the official project presentation in Sochi, the industry sources say that LUGAPORT will include 3 terminals with 5 berths of 16.5m depth to serve Panamax, New-Panamax and Baby-Capesize vessels of up to 320m long. One terminal will be a dedicated grain terminal for a 5-6 mln tons annual capacity, that will handle up to 350 railcars per day with exported grain. The demand for a grain terminal in the Russian Baltics is questioned by experts, as new capacities are more needed on the Black Sea and on the Far East, because the main buyers of Russian grain are located in the North Africa and Middle East. Plus, national grain exporters have recently started penetrating South-East Asian markets. And the plans to build new grain facilities in these regions have already been boiling for a number of years, of some of them we wrote earlier. Additionally, three berths will be constructed for a general and bulk cargoes terminal to handle cast iron, pellets, ore, iron ore concentrate and metal products. This facility will be able to serve up to 750 railcars per day. Apart from that, there will be a terminal for export and import of foodstuffs, that will comprise a sheltered warehouse of 100 th. tons storage capacity. Currently, Ust-Luga is Russia’s second largest port handling liquid bulk, break bulk, general, Ro-Ro and container cargoes, in total over 20 types of cargo. Its overall throughput in 2017 was 103.3 mln tons, up 11% to 2016.